The Indian Navy has initiated the procurement process to induct multi-role helicopters for anti-submarine warfare, anti-surface warfare and Special Forces operations. RFI has been issued to procure 123 naval multi-role helicopters, which will be expected to serve for 30 years and should have the capacity for 10 per cent weight growth throughout its service life without affecting its operational role. The capability of the shipbased helicopters to operate out at sea, for extended periods of time on task, with enormous flexibility to avoid radar detection; make them invaluable for maritime role. Since their inception the traditional maritime roles assigned to the helicopters were reconnaissance, search and rescue (SAR), and medical evacuation. As the potential of the rotary-wing was realised, additional roles such as anti-submarine warfare (ASW) and electronic warfare began to be assigned to naval helicopters. Growing potential of the helicopters in the maritime role first came into limelight during the Falkland War when on April 25, 1982, the Argentinean submarine ARA Santa Fe was hit and severely damaged by Wasp Helicopters launched missile, to attempt escape by submerging. Kamov Ka-27 helicopter was developed for the Soviet Navy to carry out ASW role. It also carried radar, magnetic anomaly detection system or dunking sonar. The improved version of the Kamov Ka-28 helicopter was designed to search, detect, track and engage surfaced and submerged submarines. The later version of Ka-28 is capable of undertaking long-endurance ASW missions with no reference waypoints, in all-weather conditions, at a range of over 200 km, at a sea state of up to five. The helicopter can be configured to operate in search, search/attack or attack variants. The helicopter’s avionics suite includes an integrated flight navigation system and a sighting system which provides all-weather navigation, submarine detection, weapons control, return flight to the mother ship and landing approach. The latest out of the stable is Kamov Ka-31 airborne early warning helicopter, which is acknowledged as a force multiplier in the true sense. Sikorsky Aircraft Corporation is a world leader in the design, manufacture and service of military and commercial helicopters. Sikorsky helicopters are used by all five branches of the US armed forces along with military services and commercial operators in 40 nations. In 2002, the US Navy (USN) inducted the first MH-60S aircraft, the first all-new rotary-wing aircraft to enter the service in a decade. The USN also has MH-60R helicopter in service. Sikorsky has developed four generations of maritime helicopters including the proven Sea Hawk, Super Stallion and Sea King helicopters that support the maritime operations of navies across the globe. Sea Hawk series is a multi-mission USN helicopter based on the US Army UH-60 Black Hawk and is a member of the Sikorsky S-70 family. The USN uses the H-60 airframe under the model designations SH-60B, SH- 60F, HH-60H, MH-60R and MH-60S, which can be deployed aboard any air-capable ship. In recent times, the development of MH-60R-“Romeo” has come to be recognised as the most formidable weapon system. MH-60R is considered as a ‘game changer’ and is equipped for multiple roles including ASW, anti-surface warfare, SAR, naval gunfire support, surveillance, communications relay, logistics support, personnel transfer and vertical replenishment. 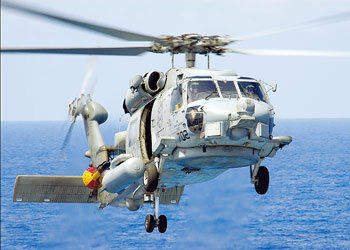 Lockheed Martin has been awarded a contract to develop a new radar system for MH-60R. The automatic radar periscope detection and discrimination system is to be delivered this year onwards. For countermeasures, it is fitted with Lockheed Martin’s AN/ALQ-210 electronic support measures system. Electronic warfare systems include the ATK AN/AAR-47 missile warner, laser warning system, BAE Systems’ AN/ALQ-144 infrared jammer; BAE Systems’ AN/ALE-39 chaff and flare decoy dispenser. Lockheed Martin provides the digital cockpit common to the MH-60R and MH-60S helicopters, while Sikorsky manufactures the airframe. Sikorsky offers the capable multi-role S-70B Sea Hawk ASW/anti-surface warfare (ASW/ASuW) weapon system with a modern, battle-proven, in-use, low-risk ASW/ASuW mission solution. The S-70B model is a blend of field-proven technology and state-of-theart airframe, avionics and mission equipment making it like its counterpart, the MH-60R helicopter, which is the world’s most capable helicopter available today. NH Industries’ design makes extensive use of composite materials instead of riveted metal alloy plates which makes NH-90 helicopter lighter and sharply reduces routine maintenance and corrosion issues. Electronic fly-by-wire systems also contribute to the lift capacity by saving the weight of heavy power boosted hydraulic control systems. A pair of Rolls-Royce-Turbomeca RTM322 engines delivering 2,412-2,544 shaft horse power (shp), GE T700-T6Es delivering 2,269-2,380 shp, or GE CT7-8F5s delivering up to 2,520 shp at sea level power the helicopter. The NH-90 is produced in two variants; namely tactical transport helicopter (NH-90 TTH) for troops, and the NATO frigate helicopter (NH-90 NFH) for naval utility and anti-submarine. A high cabin version (HCV) option for any variant raises the cabin height from 1.58 metres to 1.82 metres, increasing the cabin volume from 15-17.5 cubic metres. The high cabin is especially helpful for long search and rescue operation or medical evacuation flights, where medical personnel need to be able to stand up and move freely. The NH-90 NFH naval variant can be used as either utility helicopters or in ASW role. ASW helicopters add naval radar, dipping sonar and sonobuoys, and up to two missiles or torpedoes on side pylons. Customer acceptances for the NFH naval variant were reportedly expected to begin in the second half of 2009, but actually began only in mid-2010, and as per available reports, fully mission-ready NFH variants are expected to be inducted shortly. The Indian Navy had issued a request for proposal (RFP) to globally renowned contenders, United Technology’s Sikorsky S-70B and the European NH-90 for 16 plus eight (option clause) multi-role helicopters as replacement for Sea King 42 and 42A which have already been phased out in 1990-91. Reportedly, the procurement process has reached the final stages and the commercial negotiations are expected to commence shortly. 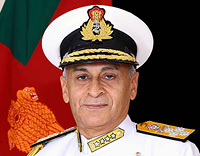 In order to augment the multi-role helicopter fleet for the ships and the Air Squadrons ashore, which were commissioned from 1997 onwards, as also to equip the ships which will be commissioned as per Fourteenth Naval Plan until 2020, Indian Navy has initiated the procurement process to induct multi-role helicopters for anti-submarine warfare, anti-surface warfare and Special Forces operations. Request for information (RFI) has been issued to procure 123 naval multi-role helicopters (NMRH) which was initiated nearly two years ago. RFI for NMRH stipulated the requirements for the rotary-wing to be capable of performing all the specified roles with common airframe, engines, avionics as for multi-role helicopters, and be capable of changing roles with ease. The significant features of the RFI stipulate that “the NMRH should be of contemporary design with modern, reliable and fuel-efficient engines and fully-integrated advanced avionics and weapons suite, employing the latest concepts for detection, identification, classification of surface and subsurface targets along with the ability to detect air targets”. In addition, the helicopter should have the air-to-air refuelling capability to enhance both its endurance and reach at sea. The RFI called for helicopters with a maximum all-up weight of between 9 tonnes and 12.5 tonnes. The NMRH, which will be expected to serve for 30 years, should have the capacity for 10 per cent weight growth throughout its service life without affecting its operational role. The secondary roles expected of the aircraft, include electronic intelligence, SAR, external cargo carrying, casualty evacuation and CSAR. 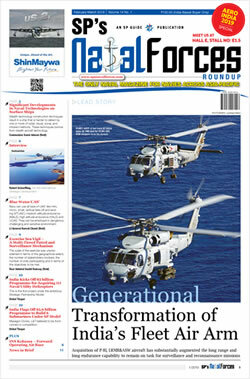 The offered helicopters should be capable of operating even from the medium-size frigates. The helicopters should be equipped with sound wing folding mechanism to be able to fit in the ship’s hangars of length 15.5 metres, width 5.5 metres and height of 5.3 metres. In its primary role of ASW and anti-surface warfare, the aircraft should be capable of autonomously locating and destroying submarines, compiling an integrated picture of the situation above and below the surface, and operate in all-weather conditions. For its secondary role for special operations, the aircraft should be fitted out to carry unguided rockets and guns. However, at present not much activity seems to have taken place in the procurement process for NMRH.